Though it could perhaps have been a little shorter and tighter, Iron Void's 2015 sophomore still breezes through the 'difficult second album' test. Released a year after their promising eponymous full-length debut, 'Doomsday' is another example of the age-old tale of the 'difficult second album'. After a solid, positively received first release, it's always a dilemma as to whether to play safe and deliver more of the same, or to develop and experiment a little, thus risking the ire or the disappointment of hard-won fans and supporters. Stick or twist is what it boils down to, in essence. It's a gamble either way, and is what can make releasing a second album a pivotal moment for any band. Iron Void, Yorkshire's finest Doom Power Trio have returned bigger and bolder - 'Doomsday' clocks in at a whopping 59 minutes - but for the most part, have maintained the same winning Trad Doom sound that worked so well for them the first time around. That's not to say that there's no progression in evidence here, though, because there most certainly is. Whilst 'Iron Void' was raw and vital, bursting with gnarly Doom energy, this second album builds on that foundation and adds an assured maturity to the band's sound. Opening track, 'Doomsday' builds patiently into a bruising Trad Doom epic, laced with melancholy and bitterness, even throwing a bit of politics into the mix as vocalist Sealey drawls 'politicians hide in their secret room/the lies they have told have become their Doom/too late to change in the final hour', a line which in these days of post-truth and fake news now seems particularly prescient. 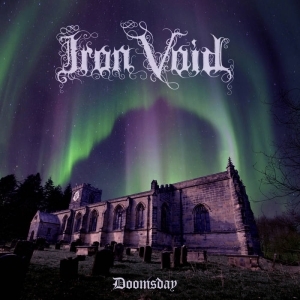 Similarly to the debut album, Iron Void have shown some real songwriting prowess, with interesting subjects, thoughtful lyrics, and some of their trademark infectious choruses. 'Path to Self Destruction' is a particular highlight; an assured, slow building Trad Doom powerhouse that begins with acoustic guitar before morphing into a gargantuan beast of a riff complimented by sorrowful lyrics, and a chorus of 'you're in the grip of disillusion/and now you see your destiny/you're on the path of self destruction' that is maddeningly catchy despite its grim forebodings of oblivion. 'Doomsday' certainly avoids the, well, Doomsday scenario of a disappointing second album. Musically, it's more adventurous with longer tracks, the occasional acoustic flourish that accentuates the heaviness of the full-on Doom, and some Stoner Metal flavour, particularly on the excellent 'The Answer Unknown' with trippy lyrics like 'purple smoke fills up the sky/lights dancing in my eyes/colours racing through your mind' and a blistering solo that is possibly the finest of a very decent bunch on this album. There's even a hint of a NWOBHM feel on the fast and furious 'Gates of Hell', which gallops along at a blistering pace and cranks up the aggression a notch. With a playing time of a shade under an hour, 'Doomsday' does perhaps overstay its welcome by a track or two, slightly running out of steam in the last third of the album, and could have benefitted by being slightly leaner. But with so many positives on the album, it doesn't detract too much from an overall fantastic second outing from a band that are building a solid body of work, and deserve to build their fanbase exponentially. As revealed in a recent interview with Doom-metal.com, a third release is imminent. I have a feeling we're in for a treat.